Trees are an important part of many landscape paintings, but I think of many of the paintings I've done of trees as portraits. Trees are not just distinctive by species, but they are distinctive as individuals. I adored this "Laurel Tree", which grew at the side of Paseo de Montenejo in Mérida, Mexico. For more information on this painting, see the section of this website called Bermuda and Mexico. "Paper Birch and Bluebells" Oil 14" x 16" Also available as a reproduction. Every May, a large bluebell field blossoms in Brooklyn Botanic Garden. 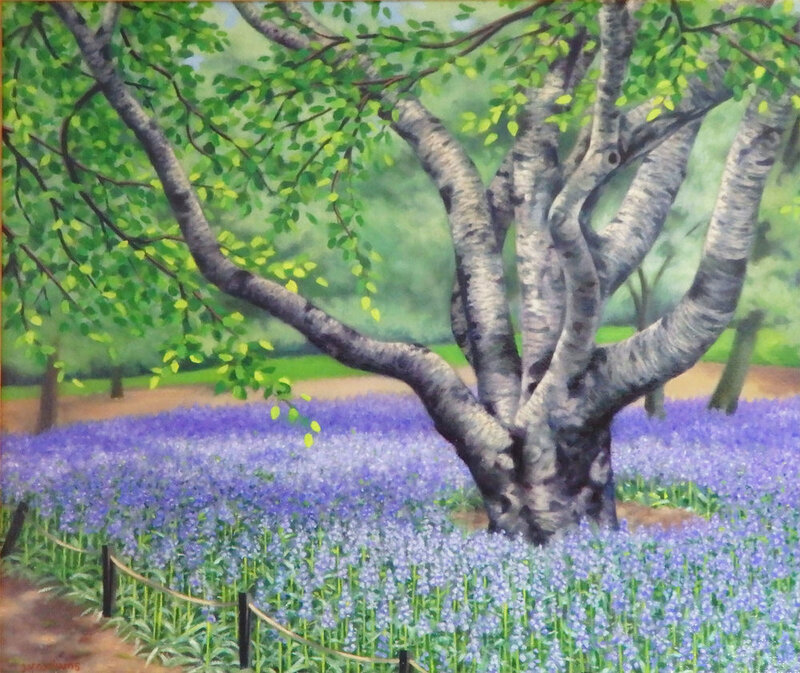 The beautiful tree in "Paper Birch and Bluebells" has died and has been removed since this picture was painted. I wish I had made the time to paint it again before its passing. "Crabapple Stump" sketch Oil 4 "x 4"
The "Crabapple Stump" in Brooklyn Botanic Garden was too interesting to pass up. It had not been pulled out yet because the branch that you see reaching away from it at the top of the painting will reach to the ground and start another tree. Once the new tree is well established, the old stump can be removed. 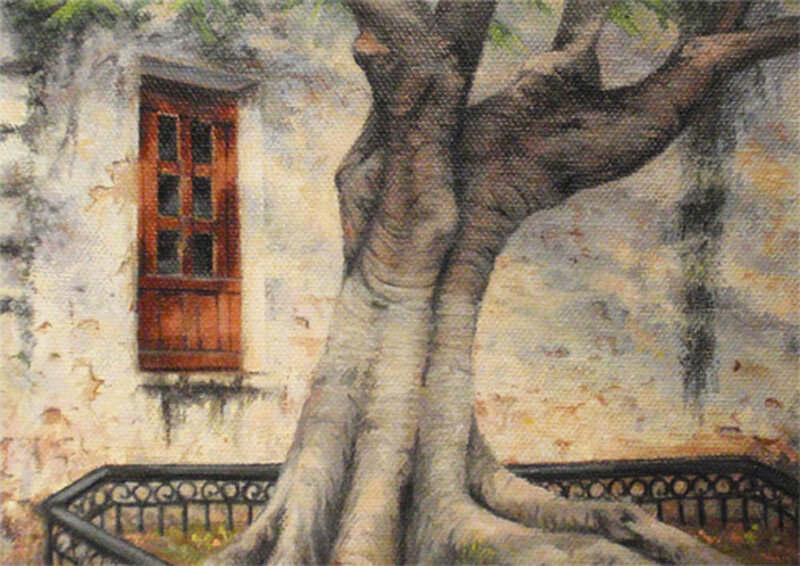 "Conversation Bench" Oil 5"x 7"
"Conversation Bench" depicts a scene in Mérida, Yucatán, Central Mexico. This picture also appears in the section of this website entitled "Bermuda and Mexico". For more information, find this section in the drop-down list under Artworks on the Home page navigation bar. "Dead Tree" Watercolor 4"x 5"
"Dead Tree" is one of my favorite tree portraits. The splashy textures of foliage, bark and on stones make this a tactile experience for the eyes as well as helping to relate the variety of elements to each other. "Fungus, Central Park" Watercolor 6 1/8" x 5"
The above painting, "Fungus, Central Park" shows a fairly unusual scene in Central Park. This must have been a generally shady side of the tree to allow a large fungus like this to take hold on it. "Danzón, Santa Ana Park" Oil 5"x 7"
"Danzón, Santa Ana Park" also appears in the section of this website called Bermuda and Mexico. What I love most about this image is the way the tree almost seems to dance with the window in the Catholic church, as well as the shadows that dance on the church wall. "Daffodils and Japanese Cherry Tree" Oil 6"x 8"
"Daffodils and Japanese Cherry Tree"was a bit of an experiment. I used a palette knife to scratch some of the light-colored grass shapes out of the wet paint. 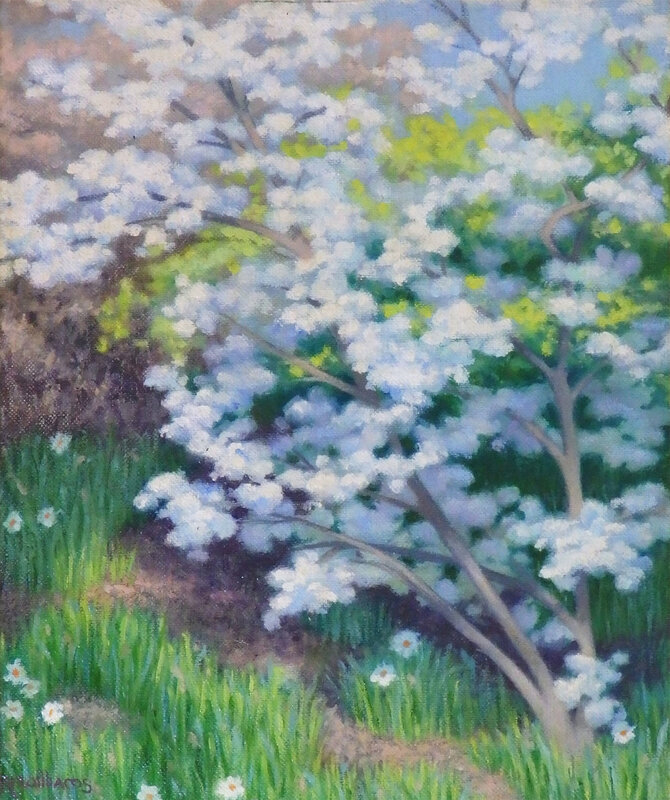 "Blooming Crabapple" Oil 9 1/4" x 13 1/2"
This "Blooming Crabapple" in Brooklyn Botanic Gardens will eventually begin to send out roots where the sagging branch touches the ground. A new tree will begin to grow there before the parent tree dies of age, disease or damage done by insects. "Old Crabapple Stump" Oil 10" x 8" ? You can see that this "Old Crabapple Stump" was still hanging on from the healthy-looking quantity of leaves at the top of the painting. This tree in Brooklyn Botanic Gardens was allowed to stand for many months longer, but was already slated to be removed. "Flowering Japanese Cherry" Oil 6"x 8"
"Flowering Japanese Cherry" is another painting that was inspired by plantings in Brooklyn Botanic Garden. White blooms can be very challenging to paint, as depicting the volume of solid-white blooms requires very slight variations in value and hue. "Beside the River Ness" is different from my other watercolors largely because the paper had an obvious laid finish that I took advantage of to depict the texture of the bark. This watercolor shows a typical grey summer day in Scotland. You will find more paintings of Scotland in the Britain section of this website. "Blossoms on Plaza Street" Oil 10"x 8"
I'm not sure if "Blossoms on Plaza Street" portrays a blooming tree or a bush, but it seems to belong in this website's category with trees. I returned to Bermuda's Botanic Gardens several times in order to finish this small painting, "Banyan and Cockerel". I was very pleased that this picture was purchased by a collector who also owns master works.This painting also appears in the section of this website called Bermuda and Mexico. "Eucalyptus Trees and Bracken" Watercolor 8" x 10"
The scene in "Eucalyptus Trees and Bracken" was a view in Crarae Gardens in Scotland. Eucalyptus trees are not native to Scotland (most varieties are from Australia), but a number of tropical plants can grow in sheltered areas here. "Moss and Lichens" Oil 5"x 7"? 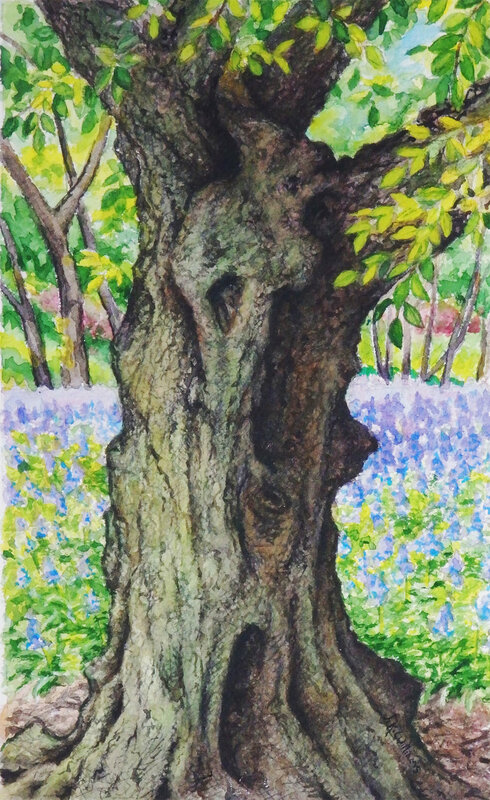 "European Hornbeam" Watercolor and graphite 8" x 4 3/4"
This "European Hornbeam" stands in Brooklyn Botanic Gardens beside the bluebell field. 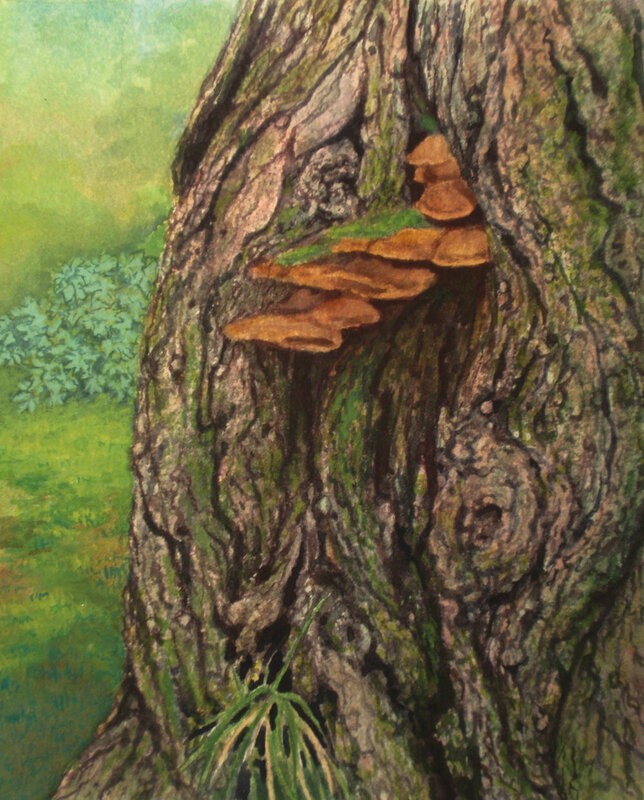 This watercolor looks a bit different from most of my watercolor pictures, partly because I have used graphite pencil as a shortcut to rendering the bark's texture, and because I have also reduced the range of values on the tree trunk. "Trees By the Falls, River Ness" Oil 5" x 7"
"Trees By the Falls, River Ness" was painted on a relatively sunny day in Inverness, Scotland on an island park in the river. Note the lichens on the trees and the mosses on the bark and dangling from some of the branches. See British Isles for more British scenes. "Cornelian Cherry" Oil 9 7/8" x 7 7/8"
This "Cornelian Cherry" in Brooklyn Botanic Garden is partially covered with watersprouts. These shoots, which rise up from a branch or the trunk of some fruit or nut trees, are not good for the tree and should be pruned away. 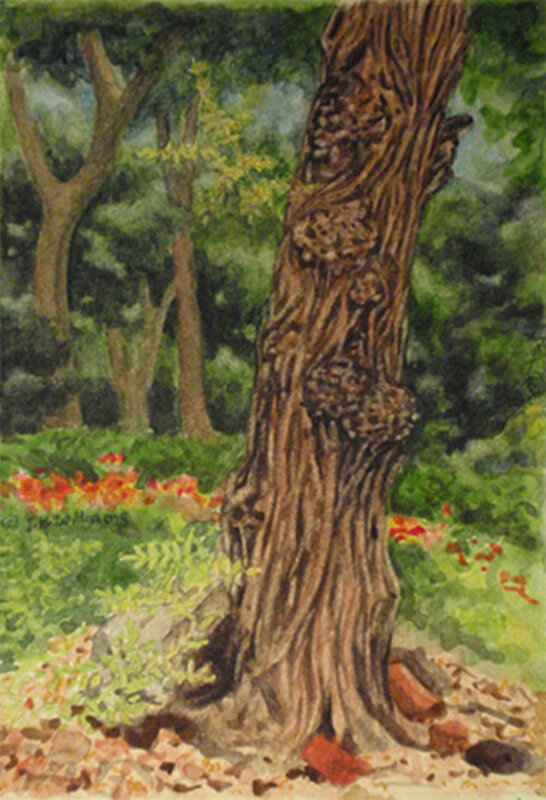 "Cherry Tree Near Bethesda Fountain" Watercolor 4 1/2" "x 6 1/8"
"Cherry Tree Near Bethesda Fountain" was painted in Central Park. What I like most about this tree painting is the way the tree seems to be alive with character. I find myself wondering what it might have to say. "Granddaddy" Oil 6"x 8 1/2"
This is a simplified portrait of a tree I call "Granddaddy" in Brooklyn Botanic Garden. I don't recall the type of tree this is, but certainly the most interesting trees are elders such as this that develop spreading trunks, gnarled roots or contorted or sprawling branches. "Spring Friends" Oil 5"x 7 3/8"
"Spring Friends" is a March or early April painting of crocuses blooming in the morning sun in Brooklyn Botanic Garden. "Daffodil Hill" Oil 4 1/4" x 7 1/4"
I took many liberties with the tree and the surrounding scene in "Daffodil Hill", which was inspired by Daffodil Hill in Brooklyn Botanic Gardens. "Tree in Washington Square Park" Watercolor 6 1/2" x 4 1/2"
It's not easy to find a painting spot in a small, busy park - such as Washington Square Park in New York City's Greenwich Village district - that doesn't include people, park benches or sidewalks. But I found a place for" Tree in Washington Square Park" that did not require a lot of editing of the scene. The "Garden Tree" was in the Botanic Garden of Bermuda. For more information, see the section of this website called Bermuda and Mexico. "Locust Roots by Lamplight" Oil 5"x 7"
The scene in "Locust Roots by Lamplight" was illuminated solely by night lighting in Parque Santa Ana in Mérida, Mexico. For more information on this painting, see this website's section of artwork inspired by Bermuda and Mexico. "Lampost and Tree Near Tavern on the Green" Oil 4"x 3"
The site of "Lampost and Tree Near Tavern on the Green" is near a famous restaurant in New York City's Central Park just off Central Park West. "The Old Tree" Monotype 6 1/2" x 4 1/2"
"The Old Tree" was inspired by one of my photos of trees, but I no longer remember where I took the photo.